ATC Industry Solutions offer a range of seals that are engineered for pneumatic applications. Pneumatic applications are those that are are commonly powered by compressed air or compressed inert gases and involve rotary or reciprocating motions which may be at very high speeds. These seals are referred to as pneumatic seals. This type of seal requires minimal lubrication when exposed to air in order to create a tight seal. The difference between a pneumatic seal and a hydraulic seal is pressure. Pneumatic seals typically have a pressure range of 1 to 150 psi, while hydraulic seals can withstand pressure greater than 10,000 psi. 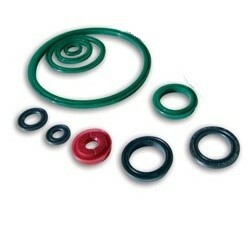 These seals are manufactured from a range of materials depending on the requirements of the application. Materials include Viton, EPBN, Nitrile, Polyethelene, PTFE etc. Special compounds may also be used for longer life (reduced wear), higher temperatures and reduced friction. ATC Industry Solutions can supply pneumatics seals to meet any customer needs. Contact us for more information.